Cascara sagrada may be lesser-known outside of its native regions, but its immense value as a digestive agent has seen it stand the test of time. Used since antiquity as a means of providing medicinal relief, cascara sagrada has carved itself a place in humanity as an alternative and traditional remedy. A native to northwestern North America, cascara sagrada's name is derived from the Spanish for "holy bark" in homage to the tree's medicinal efficacy. Stimulating bowel movements. The laxative effects of cascara sagrada are triggered by anthraquinones, which irritate the bowels and thereby stimulate their movement. Preventing the formation of gallstones. Cascara sagrada's ability to promote gallbladder cleansing has not been fully studied so far, so its exact mechanism of action remains unclear. The main active ingredients in cascara sagrada are quinine compounds: most notably two separate types of anthraquinones and four closely related types of cascarosides. These compounds work by irritating the colon and thus triggering stronger and quicker movements in the intestine. A strong bowel movement will theoretically follow soon after. In addition, aloe-emodin seems to relax smooth muscles slightly, making the bowels more sensitive. Finally, although the full chemical profile of cascara sagrada has not yet been detailed, some studies report that the bark contains different sugar-derived compounds. 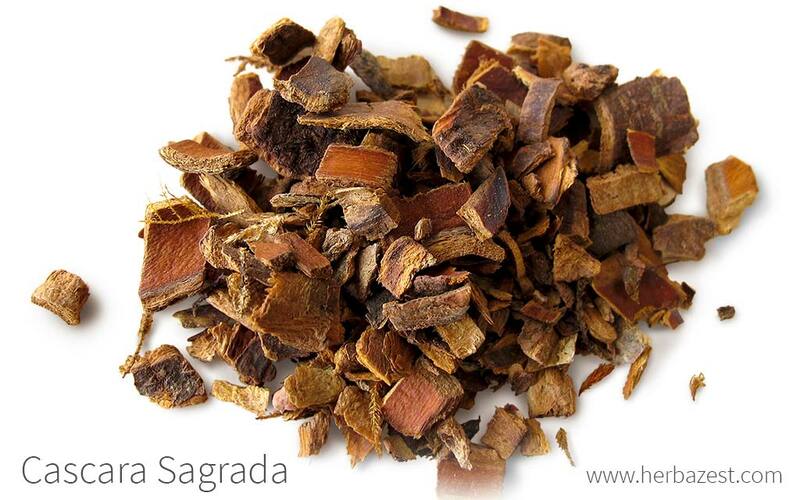 CASCARA SAGRADA PROMOTES BOWEL MOVEMENTS BY DIRECTLY CAUSING IRRITATION IN THE LOWER DIGESTIVE SYSTEM. Psyllium and tamarind also possess laxative properties, whereas artichoke and boldo can be used as alternative sources for stimulating gallbladder function. The main potential side effects of cascara sagrada are stomach cramps and abdominal pain. This herb should not be consumed for more than 14 consecutive days at most - though no more than one week is recommended - as the bowels can become dependent on its anthraquinones for evacuation. Additionally, long-term consumption of anthraquinones may result in liver damage or have a carcinogenic effect. As with all herbal supplements, pregnant and breastfeeding women should not consume cascara. This herb can interact with medications, other herbs, and certain conditions, so consulting a doctor before taking it is strongly advised. Aside from minor industrial uses, cascara sagrada is exclusively used as an herbal remedy. It should not be the first choice of laxative, but rather a last resort after dietary changes and bulk laxatives have been attempted. Herbal preparations are made chiefly from the bark of the plant. Infusion. Two grams of cascara sagrada bark, steeped in 150 mL of boiling water for about 10 - 15 minutes, make a warm infusion that can be taken for constipation relief. Liquid extract. Cascara sagrada liquid extract is typically taken in 2 - 5 mL doses three times a day for no more than a week. The smallest dose that still stimulates bowel movements should be taken. Capsules. Cascara sagrada capsules should contain 20 - 30 mg of anthraquinones. Dosage varies by manufacturer. Overharvesting of cascara sagrada is a major problem in the Pacific Northwest forests, so it may be difficult to find fresh - or even dried - versions of the bark, especially outside of native areas. Where it is available, it can usually be found in specialized health stores. It is also possible to find provisions online, where a greater selection of quantity and quality is available to buy from across the globe. Herbal supplements that feature cascara sagrada are readily available through many online retailers. Capsules and liquid extracts are the most common remedial forms of the herb. It should be noted, however, that purchasing the herb involves a risk for the consumers, since not all products that include cascara sagrada active ingredients are regulated by the Food and Drug Administration (FDA). Cascara sagrada is a small, deciduous tree native to North America. It is is largely found in forested mountains at low elevations and in moist canyons, swamps, and bottom lands. This species is seldom grown outside of its preferred moist, forest-like conditions, but it can and has been done successfully cultivated for ornamental purposes. Mostly grown from seeds, which are sown outdoors in late autumn, preferably in a cold frame, at a depth of 3 - 25 mm. They can survive winter temperatures as low as 5°F (-15°C). Moist, loamy soil is best for the development of cascara sagrada, but it can also thrive in clay or sandy ground. Cascara sagrada tree is quite tolerant to shade, though sunlight is welcome. It does best in close stands with side shade but plenty of overhead light. For propagation purposes, the seeds should be collected two weeks before they ripen, from July to early September, when berries are purplish black. Cascara sagrada is a hardy plant, being relatively free from insect pests and diseases. Borers, aphids, scales, and moths may be attracted to this species, but they don't pose a serious threat for its development. Standing up to 40 feet (12 m) tall, the trunk and branches of cascara sagrada's tree have dark, often red-tinged bark, thin and smooth when healthy. Oblong leaves surround small red berries that turn black when they ripen. Felled trees can sometimes rise again from their stumps. Rhamnus purshiana is a member of the Rhamnaceae or buckthorn family, which contains about 900 species. Cascara sagrada differs from its flowering relatives mainly in regards to its climatic requirements. While the majority of the family are tropical and subtropical plants, cascara sagrada thrives in cooler temperate climates. Cascara sagrada has no true identified subspecies or varieties. However, its various common names in English sometimes lead to confusion with other plants. Bearberry is used often to describe the plant in Canada, but official agricultural resources state that that name it is better ascribed to the similar-looking Arctostaphylos uva-ursi, which lacks the same medicinal properties. Bayberry is also used, but it more frequently refers to Myrica pensylvanica, which grows in eastern North America. Likewise, California buckthorn is not the same as Rhamnus californica, the California coffeeberry, though they are closely related. Long before the first European settlers arrived, cascara sagrada was used by Native American tribes indigenous to the Pacific Northwest. It is reported that they found the herb useful as a potent laxative and digestive aid as well as a spiritual prevention against evil and hexes. When it was later shown to Spanish colonizers in the 1600s, and subsequent American settlers from eastern states, its healing talents were embraced by all inhabitants of the herb's native regions. Scientific pharmacies began utilizing it in 1887, but developing technology led to its decline during the 1960s. Recent years, however, have seen a resurgence in its popularity. These days, cascara sagrada makes for an important pharmaceutical crop, particularly in the U.S. and Canada. In the former, the herb is an ingredient in roughly 20% of the laxative market, an industry valued at around $400 million USD (per year). In the latter, bark from the tree is found in roughly 200 drug products nationwide. Plantations in these both countries have developed to suit demand, but wild growth generally produces better quality. This has lead to overharvesting and depredation, which are currently an issue for the industry. Not stopping at culinary and medicinal ends, further uses for the cascara sagrada tree have been explored over the years. Its trunk and branches have provided wood for fuel and building materials for centuries, and bark was once used to dye fabric shades of gray and brown. It is also a popular ornamental plant, particularly in Europe, and supplies food for wildlife in summer months. Its presence is said to control erosion near streams and rivers further inland, and reforesting efforts use it to this effect.